A sister group of sorts to Grizzly Bear, Department Of Eagles is spearheaded by that band's Daniel Rosen, and have made the transition from Melodic Records to the mighty 4AD, marked by a sonic overhaul along the way. 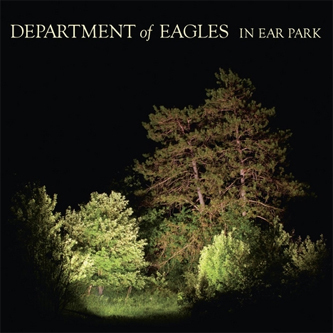 In Ear Park is dedicated to Rosen's father, and appropriately much of the material here is dominated by memory and reminiscence, something brought brilliantly to life by the faint air of ghostliness cast over the recording aesthetic. The quality of writing preserves an alarmingly high standard across the full span of the record, and the presentation evokes a wide variety of the American indie scene's great and good, from the Bon Iver-esque vocals to a vintage, reverberant and folksy sound that wouldn't be too far removed from Fleet Foxes were it not for the liberal use of decidedly un-Laurel Canyon-esque harmonic intervals and an arrangement style that's always teetering on the brink of the avant-garde. A real feast of an album this, and one that comes highly recommended.